Walking on the streets of the Historical District of Salvador, we feel like being taken back to the ancient times of Brazilian History. Salvador was the political and administrative center of Brazil for more than two centuries (1549/1763), being the main port of the southern hemisphere until the eighteenth century. Salvador also has a rare natural beauty, with many amazing beaches through its coast. Pelourinho, a place where the visitor breathes culture and history, is considered a patrimony of humanity by Unesco. It has been recently restored to its sixteenth, seventeenth, and eighteenth century splendor. It retains a traditional atmosphere rarely found in old cities. At Night, there are some shows of Bahia´s typical kind of music. Protected by a chain of coral reefs, the sea along this beach is calm with small waves and lovely tidal pools at low tide. At the end, nearest the Christ Statue, the waves are bigger with nice curls which are good for surfing. Divers or snorkelers will also enjoy the sunken ship just beyond the Lighthouse and the coral reefs. The main coastal road, which is lined with a good selection of bars, restaurants and hotels, runs past this beach. The Abaeté's Park is an immense ambient and tourist patrimony, composed by dunes, lagoons, native vegetation and 255 hectares of urban area. The park has more than 12 thousand square meters of preservation that transform the space into one of the biggest centers of ecological leisure in Brazil's northeast. It is one of the richest and most beautiful churches in Brazil, and it is covered with gold inside. The first Franciscans arrived at Salvador in 1587, and the convent construction started a century later. The church started to be built only in the first half of the XVIII century, and the baroque front is from 1723. The baroque panels, formed by Portuguese tiles, reproduce the legend of Saint Francis’ birth and his renouncement to all material affairs. The central nave crosses another smaller nave, forming the Cross of the Lord. Besides being a traditional trading center for handicraft and a very important touristic spot, Mercado Modelo (Modelo Market) is also a space for meeting people and getting together. Bohemians, poets, singers and traders find, at the market, the ideal place for their activities. Since it was founded as a food-supplying center for Salvador, it has joined traders, fishermen, sailors and simple people from the city. Those meetings took place among bags of dried shrimps, baskets full of peppers, cigars from the Recôncavo and bottles of "cachaça". Symbol of Bahia's culture and history, the market attracts people from all over the world. Over 2 million tourists went to the Modelo Market in 2000 to buy souvenirs. Founded on August 10th, 1959, it is located in Santa Tereza Convent, one of the most notable architectonic settings from the 1600s. Its collection includes sculptures made from wood, soapstone, clay and ivory, and gold pieces. There are, also, silver pieces and painted wall tiles from the centuries XVII, XVIII and XIX, as well as some Bahia’s artists collections. Known as the "Brazilian Polynesia", Praia do Forte has so many leisure options that it is hard to know where to start. There are 12 kilometers of beach surrounded by dunes, coconut groves and tidal pools. There are many ways to enjoy the place, by jeeps and horses. This chapel is adjacent to São Francisco Church and it was constructed in 1702. Its entire front, which is unique in Brazil, is decorated with sandstone sculptures. There are beautiful paintings on the ceiling, created by Franco Velasco, in 1831. The church has a sun clock and a museum. 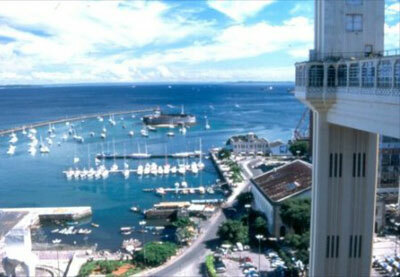 Salvador’s Carnival have surpassed that from Rio de Janeiro, becoming, this way, the most popular festival in Brazil. The six-day long festival attracts an estimated 2 million people, who consume 5 million liters of beer, 3 million liters of soft drink, 2 thousand tons of sandwiches and 300 tons of ice cream! The 162 Carnaval groups parade happens on different locations simultaneously, including the Historical Center and other districts. In a different way from the Carnival in Rio, where there is a Samba Schools parade, in Salvador everyone is welcome to the parade with their favorite group, all you need to do is buy a costume. The costume guarantees you the right to parade inside the corded-off area around the bands, where it is much safer than on the streets. The costumes must be ordered in advance. Another distinguishing factor of Salvador's Carnival is the presence of the "trios elétricos", invented in 1950 by Osmar and Dodô. These are essentially huge trucks with many speakers, rumbling loudly, carrying the band and singers of the "blocos". Participants usually follow behind, dancing and jumping. In 1604 there was already a path from the king’s house to the beach in the Lower City called "Nossa Senhora da Conceição". In the XVIII century there were already ten steep streets to downtown Salvador, but it was very hard to go up and down. Because this reason, it was necessary to create some lifts to make easy the transportation between the Lower and Upper cities. The first lift already existed in the XVII century, but it was a kind of crane. Along three centuries these “cranes” were multiplied. On December 8th, in 1872, the most famous lift was founded – Lacerda´s Lift. It was first called Conceição Elevator and used to have only one tower of 58 meters high. It was restored and got another tower in 1932, and had its name changed to Lacerda, in honor to the man who had idealized and constructed it. This beach is a real paradise for surfers thanks to its big waves. The main attraction in the beach is the lighthouse with a wonderful view. Resulting of a process of consciousness of African descendants, the afro groups are made up, in the majority, of these descendants, who go to the streets conducted by drums and perform with outfits, dance and rhythms inspired by their ancestors’ culture. Some African groups, such as Olodum, are internationally known. Its possible to watch they every Tuesday night at Pelourinho. It was founded on March 7th, 1987, in honor to Jorge Amado (a great Brazilian writer, from Bahia) and was idealized to preserve and study his work – which was translated to more than 49 idioms – and, besides that, Bahia’s artistic and cultural manifestations. Its collection includes Jorge Amado’s books, and a great number of pictures, videotapes, posters and objects related to him and to his work, besides letters and documents. This festival takes place in the second Thursday of January every year. This ritual has been occurring in Salvador since 1754. All meet at one church, Church of Conceição da Praia and march to the Church of Bonfim 10 kilometers away, where the wash ritual is going to occur. At 1:00 am, the procession is scheduled to leave towards the Church of Bonfim. In front of the Church of Conceição da Praia there are Baianas dressed all in white with multicolored sacred beads, carrying long white vases on their heads filled with perfumed water and white flowers. Once concealed behind a thick Mata Atlantica forest, and characterized by its acid, oligo-dystrophic, black waters, ‘Dique do Tororo’ is now situated in the urban heart of South America’s oldest European settled city: ‘Salvador da Bahia’. As a result of this latest chapter in the short history of ‘Dique do Tororo’, its waters and sediments in the last two centuries have become eutrophic and suffered from heavy metal contamination. Ironically, ‘Dique do Tororo’ is nowadays recognized as the sporting, cultural and religious hub of this unique city. Built right on the ocean in the 17th century, is today a historical landmark, with its great manor house, aqueduct, dungeons as slave quarters, and underground passageway. The dungeons today house the restaurant (capacity for 220 people), where guests savor all the delicacies of the Bahian cuisine, or more traditional international dishes. A folkloric show that follows, reveals the typical customs resulted from the mixture of the Portuguese and African cultures, through a lively colorful show of song and dance. The name Itaparica comes from the Tupi and means "fence made with stones". It was named after because of the reefs that surround the island. A second version says that it comes from the name of a Tupinambá chief, "Taparica". Itaparica is part of the Brazilian History and, for this, it shelters many historic sites, such as the old houses that had the Brazilian emperors as guests. The São Lourenço Fort is situated on the north of the island, on a place that used to be known as Ponta da Baleia. Its strategic location would protect and shelter the ships that provided supplies to the town. The first Dutch building is from 1647. When the invaders went away to Recife, they destroyed the fort, which began to be rebuilt in 1711. The São Lourenço Church and the Santíssimo Sacramento Church were built in the XVIII century and are situated on the Matriz Street. Close to there, on the Tamarindeiros Square, is situated Tenente João das Botas's house, which shelters a handicrafts center. Full-day Tour to Cachoeira with Lunch: Visit to the historical town of Cachoeira, 109 km from Salvador. During the 18th century Cachoeira was the second richest city in Bahia, only behind Salvador, due mainly to its sugar cane plantations. Its churches remain as a landmark of its past. After lunch at a typical restaurant, a visit to a cigar factory and a sugar cane still. On the way to and from Cachoeira, sugar cane plantations are seen. Note: Drinks are not included. Duration 9 hours. Full-day Schooner Cruise with Lunch: Beautiful and mysterious, the islands of Bahia are waiting for you. On this exciting schooner trip, lunch included, you may admire Salvador from the sea and discover the most marvellous places in "Baia de Todos os Santos" (Bay of all Saints). Note: Drinks are not included. Duration 9 hours. Bahia by Night with Dinner and Show: The sensuality of the women of Bahia, the exotic dance movements, the capoeira, the mystery of the Orixás and the most authentic traditions of Afro-brazilian folklore are presented in this night of bright lights. Folklore show and typical dinner, enjoy the pleasures of Bahia cuisine while watching a colorful festival where groups of "capoeira", "maculele", "puxada de rede", "samba de roda" and "samba duro" show their skills and magic. Note: Drinks are not included. Duration 5 houras.